SHILLONG, India – India’s National Green Tribunal (NGT), a judicial body with legal authority that ranks just below the Supreme Court, is quickly emerging as one of the world’s most important forums for testing the idea that economic advancement is tightly wired to public safety and the security of water, air, and land. Established by India’s Supreme Court in 2010 and then quickly authorized and funded by Parliament, the government has taken pains to recruit great jurists and technical specialists to serve on the bench, and the new court has been given a striking building in the center of New Delhi – evocative green flourishes decorate the chambers, which were originally built to house a regional prince. Despite the ornamentation, there’s a doggedness that drives the spirit of this court. This much was clear to me after attending NGT hearings this month and observing the 17-member bench at work (7 judges and 10 of India’s top science, engineering, and technical experts). An undercurrent of spiritual fervor runs beneath the poorly ventilated courtroom, illuminated by harsh fluorescence, and jammed with lawyers in spotless white shirts and pitch-black suits. They huddle like penguins, straining to hear the unamplified back-and-forth between the grey-bearded judges and the much younger lawyers. And it’s easy to see why. For a journalist who’s covered a good number of important American environmental cases, from the 1979 Three Mile Island nuclear disaster to the 2010 Gulf oil spill, there is a lot to admire in the NGT’s short history and lengthening list of blockbuster rulings. First is its origin. India’s Supreme Court, buried under a landslide of environmental cases, needed help from a judicial body that could immediately command respect. India’s government, besieged by rising public concern about the country’s deteriorating cities and natural bounty, supported the idea of an independent senior court that focused on solving environmental conflicts. The NGT’s mission is straightforward but demanding: compel India’s state and national resource agencies, and the industrial executives they are supposed to oversee, to abide by the broad and largely ignored tapestry of Indian environmental law. The government also financed a network of regional green tribunals with sitting judges and equally broad powers. Two other nations – New Zealand and Australia – have national environmental courts. The United States and other Western nations enforce the law through various levels of district, regional, appellate, and supreme courts. Second, arguably no court system in the world is as active, or as determined to secure environmental stability and raise standards of behavior and practice, as the National Green Tribunal. Last year the Tribunal shut down India’s sand mining industry because of the damage it was doing to the country’s rivers and streams. In April, they shut down the entire coal mining sector in the state of Meghalaya because of the toll that unregulated – and what the court called illegal – mining was taking on water and the industry’s workers. It was the first time a court anywhere in the world had completely shut down a state-level fossil fuel industry. Both industries were ordered to dramatically change how they did business or they wouldn’t do business again. During the three mornings of hearings I attended, the four sitting justices in Court Number 1 blocked construction of a new coal-fired power plant because its builders did not comply with the permitting requirements; fined the chairmen of pollution control boards in eight northern states for refusing to comply with requests for information on air emissions; and accepted the Supreme Court’s referral of a 29-year-old case to limit water pollution in the sacred Ganges River Basin. In the case of the pollution control boards, the judges ordered the offenders to appear before them with the requested information or face jail time. In the Ganges River case, if the Tribunal succeeds, the High Court is likely to turn the rest of the case over to its lower court colleagues to go after municipalities and headwater polluters to require construction of wastewater treatment systems. It’s entirely possible that the NGT could succeed in turning one of the dirtiest rivers in the world into a much cleaner source of national pride and new jobs. As you might imagine, such active and clear interpretation of the requirements of environmental law is not sitting well with some state officials and industrialists. As one of his first acts as India’s new prime minister, Narendra Modi appointed a special commission to evaluate the effects of the NGT on India’s capacity to develop earlier this year. A report is expected in late January. Ritwick Dutta, a 43-year-old environmental attorney litigating many of the court’s most significant cases on the side of public interest, told me he doubts the prime minister will meddle with the NGT. The court’s justices, in private conversations with me, said the same thing. India’s deteriorating natural bounty, its horrid water quality, foul air, scarred land, and diminished forests are significant factors in the unraveling of its economy. The national economic growth rate is less than half of what it was in the first decade of the century, and steadily declining. The country’s capacity to attract investment from domestic and foreign businesses is tied to rehabilitating India’s physical condition – its worn cities, dirty streets, littered countryside. Dutta, one of the dozen or so senior attorneys in India’s tiny environmental bar, appears for arguments almost daily before the NGT. He said he is so busy litigating 350 or so cases a year that he has little time to reflect on the influence he and the court are having. In the moments after the Tribunal ruled in his favor and ended a developer’s bid to build a new coal-fired power plant in central India, Dutta and his colleagues didn’t even shake hands. There was no celebration at all. Keith Schneider is reporting from India as part of the Wilson Center and Circle of Blue “Global Choke Point” project on the water-energy nexus. Look for more from him in December. 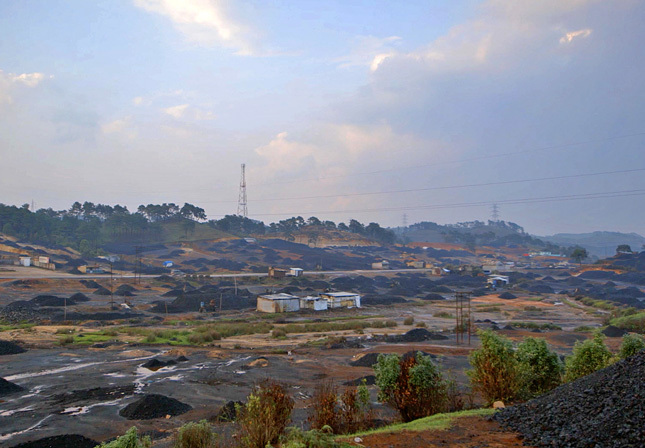 Photo Credit: Coal piles in Meghalaya state during the Tribunal-ordered shutdown of the coal industry, courtesy of Michael Miller/Wilson Center.